The 2.5-mile Staten Island Boardwalk runs along Staten Island’s own South Beach, is one of the city’s most pristine and underutilized waterfronts. The boardwalk is great for running, especially for those trying to get long runs in with a change of scenery. It’s wide and open, giving a real sense of escape from the city. 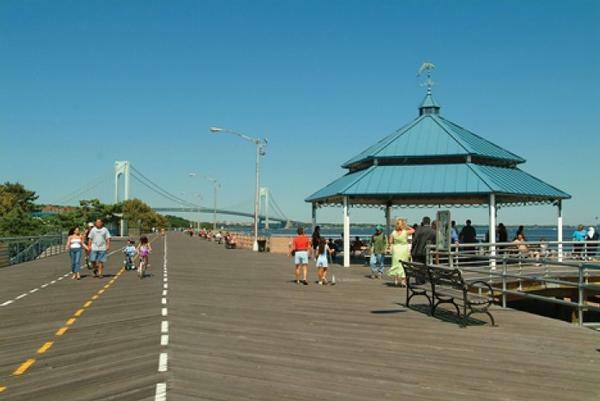 Beginning at Miller Field (an old WWII recon airbase turned into soccer and baseball fields), the boardwalk runs along the base of the Verrazano-Narrows Bridge, providing views of ships coming into the harbor, and the Atlantic. To get there from the ferry, take the S51, S52 or S81 bus to Father Capodanno Blvd. and walk towards the water. Parallels Father Capodanno Blvd. One end starts at Midland Beach off Lincoln; the other end terminates at USS North Carolina Rd. From ferry, take the S51, S52 or S81 bus to Father Capodanno Blvd.